2014 Teen Choice Awards Photos, News, and Videos | Just Jared Jr.
JJJ's Teen Choice Awards 2014 Best Dressed List Is Out! Another Teen Choice Awards show has come and gone and with it came some fantastic fashion games. Last night (August 10) we saw a ton of style stars in the making and the ones who get better each year. JJJ stayed up way too late for our own good, sorted through way too many pictures of the stars and have finally come out with our top 10 — plus our first Fan Voted Best Dressed. Check them all out inside! In case you missed anything from the 2014 Teen Choice Awards, check out JJJ‘s complete coverage! We’ve got a ton! Lucas Grabeel makes that tiny top hat a star inside the Backstage Creations Celebrity Retreat at the 2014 Teen Choice Awards held at the Shrine Auditorium on Saturday afternoon (August 9) in Los Angeles. The Switched At Birth star munch on some Sabra chips before playing a game of Simon and checking out the Dell Home Tablet. Jake T. Austin and Lucas‘ co-star Katie Leclerc also stopped the suite the next day, where she couldn’t get enough of the McFadin handbags. “I’m from Texas! I love the Texas Star on this brown one!” she was overheard saying at the suite. Robbie Amell and Italia Ricci take a load off for a minute for some Sabra Chips inside the Backstage Creations Celebrity Retreat at the 2014 Teen Choice Awards held at the Shrine Auditorium on Saturday afternoon (August 9) in Los Angeles. Meanwhile, Italia picked up some Olay Fresh Beauty Products. The next day, Richard Brancatisano and Mystery Girls‘ Miguel Pinzon stopped by the suite just before the show started. MKTO, Rixton & Alex & Sierra Take Over Backstage Creations Teen Choice Retreat - See The Pics! 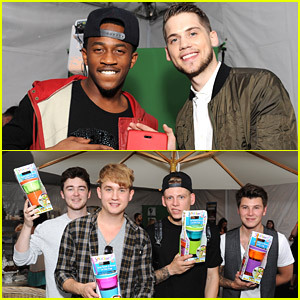 MKTO get their hands on a new Dell Home Tablet inside the Backstage Creations Celebrity Retreat at the 2014 Teen Choice Awards held at the Shrine Auditorium on Sunday (August 10) in Los Angeles. The guys played around with the new gadget while Rixton were spotted getting comfy in with the Sabra chips, just like Alex & Sierra. “We only eat Sabra. It’s on our bus when we’re on tour,” Alex & Sierra were overheard saying. Tyler Posey playfully pets a toy dinosaur inside Backstage Creations Celebrity Retreat at at the 2014 Teen Choice Awards held at the Shrine Auditorium on Saturday (August 9) in Los Angeles. The 22-year-old actor was joined by his co-host Sarah Hyland at the retreat. Tyler picked up a few Snackeez 2-in-1 Cups and even grabbed a Boodle Box! “Hopefully I’ll have a little girl one day and then I’ll definitely get her a Boodle Box,” he gushed at the booth. Awwww! Brenton Thwaites and Reese Hartwig arrive for photos at the 2014 Teen Choice Awards held at the Shrine Auditorium on Sunday (August 10) in Los Angeles. The guys were joined at the annual event by Twisted‘s Kylie Burnbury and Austin & Ally‘s Calum Worthy. “Its alright that #EarthToEcho didnt win tonight… the #TeenChoiceAwards were obviously false as Kevin Hart is NOT funnier than Will Ferrell,” Reese later tweeted. LOL! Earth to Echo was up for Choice Summer Movie, but lost out to 22 Jump Street.